If you are not aware, the ubiquitous K-Cup, created by Keurig as a system of delivering single serves of coffee through the company’s machines, are considered one of the greatest environmental threats of our time. These consist of a plastic cup, aluminium lid and filter. Most of which ends up in a landfill. 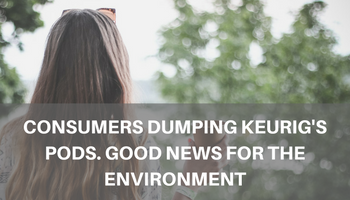 A Keurig brewer generates ten times the solid waste that would be generated from a standard drip brewer, and most of that waste isn’t recyclable. It’s estimated that in 2013 the number of K-cups sold would wrap around the earth 10.5 times. The good news is that people are becoming much more aware of the impact of their K-Cup addiction. Last year, “Kill the K-Cup,” a video made by Egg Studio Productions and released on YouTube, quickly went viral. The short film begins with foreboding music and alarming text, and has done much to raise the awareness about the environmental impact of K-Cups. All of this backlash is forcing the company to take note, and they have started investigating more sustainable approaches, but many of their solutions are not backwards compatible with the vast number of existing machines out in the world today. In 2011, the Swiss Federal Laboratories for Materials Science and Technology, headed up an investigation to find out what kind of coffee was best for the environment. The study found that automatic brewing, instant coffee and the traditional Italian stovetop espresso maker have far less impact on the environment that the popular single-serve method with plastic and aluminium packaging. Our ESE (easy serve espresso) pods are a 7-gram compressed wafer of coffee encased in a permeable food grade paper, and offer massive environmental advantages over the traditional plastic coffee pods.